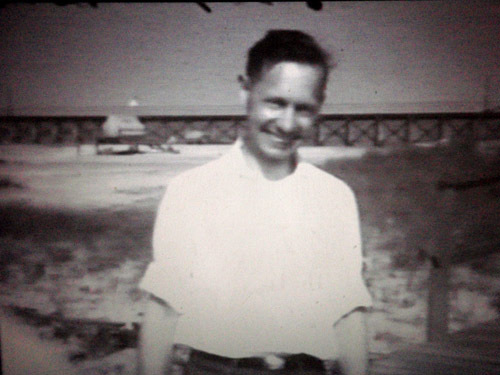 My great-grandfather, Howard Heinkel, at Brigantine, c 1928 (still from home movie). I’m lucky to have known my great-grandfather, Howard Heinkel, an extremely energetic Philadelphia doctor of German ancestry who lived to be a healthy, cogent 96. Gramps built one of the first houses on the island of Brigantine on the Jersey Shore, where he entertained three generations of kids and their families, beginning with his own three daughters in the 1920’s. 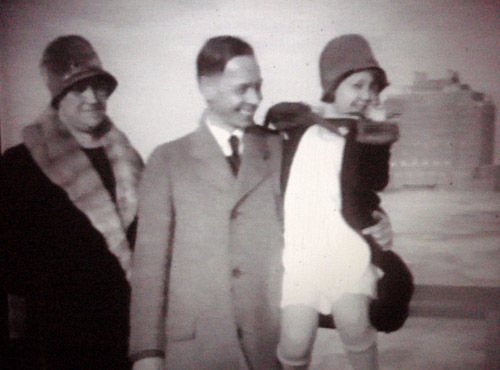 Gramps, Grandma and their youngest, in front of the Brigantine Hotel (still standing). Gramps was in most ways a forward-thinking man, what we might today call an ‘early adopter’. 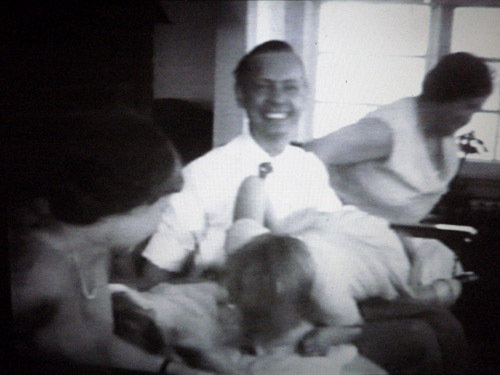 A health nut, he worked out on a rowing machine and stationary bicycle, did not smoke or drink, and practiced a form of homeopathy as a doctor, making many of his own remedies. He was also an avid and enthusiastic world traveler, treating batches of grandkids to Grand Tours of Europe by ship and cross-country road trips by car. 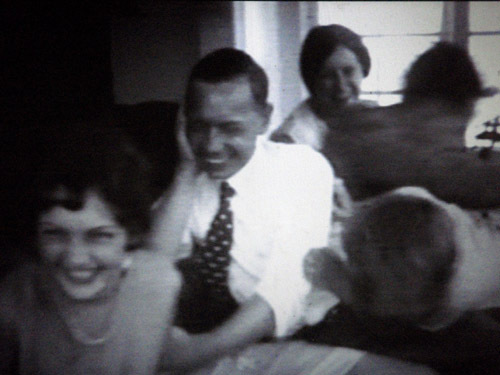 He also shot beautiful 16mm home movies throughout his life, some of which I’ve had digitized (all of these stills are screen shots from his films). A man of rigorous personal habit and routine, Gramps had a saying to accompany most major aspects of daily life. I only remember a few, my favorite being ‘Stir thy lethargy!’, used playfully to animate people into action, his preferred default mode. This motto still pops into my head whenever I’m feeling discouraged and reminds me that sometimes all you need to do is to get the engine running in order for everything to fall into place. I was surprised recently when I stumbled upon the quote in its entirety, ‘Stir thy lethargy- go forth, expiate thy sins!’. I have not been able to find its origin, but it was quoted in association with freemasonry. I’d love to hear from anyone who can tap its source. Gramps loved horsing around with his daughters on the sun porch (that’s my grandmother in the foreground of the top image, who just celebrated her 100th birthday). Posted by Scott on April 2nd, 2012, at 4:19 pm, and filed under aesthetics, all, daily handwork, studio process.